The little Aussie ducks that make an early leap of faith. TAKE A JUMP! 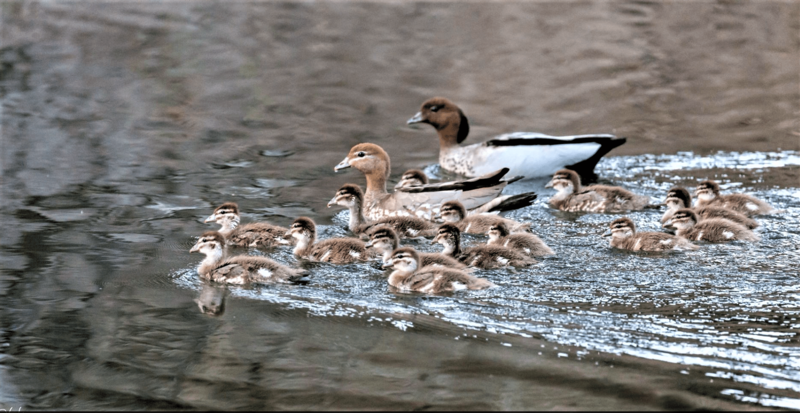 – AUSSIE WOOD DUCKS. Home → Blog → TAKE A JUMP! – AUSSIE WOOD DUCKS. I wandered out into the garden one spring morning and heard a soft clucking coming from high in a gum tree. It was a goose like duck, which was soon joined by a wooing male. Such handsome birds. 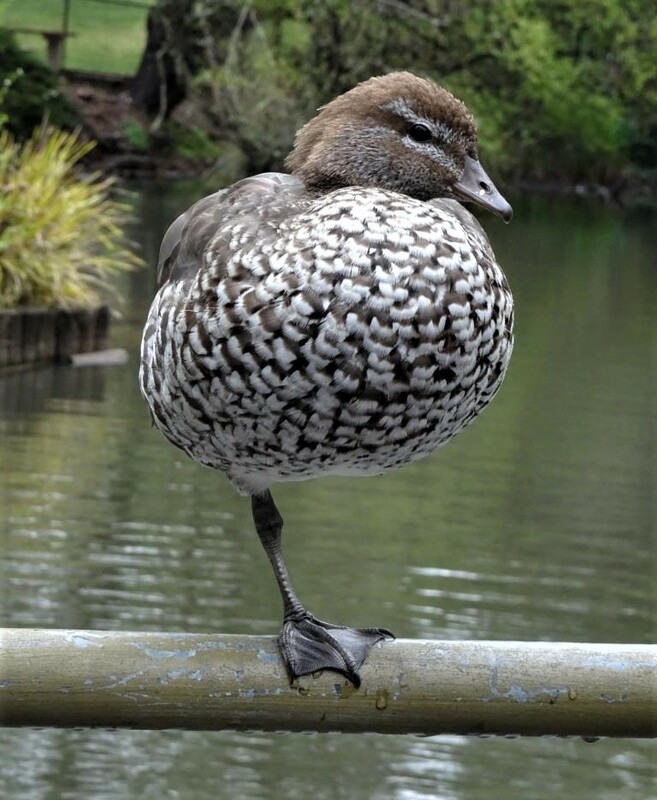 They are Australian native wood ducks, and mainly feed on grass and other vegetation. Sometimes there are dandelions for dessert (if I have neglected my weeding). 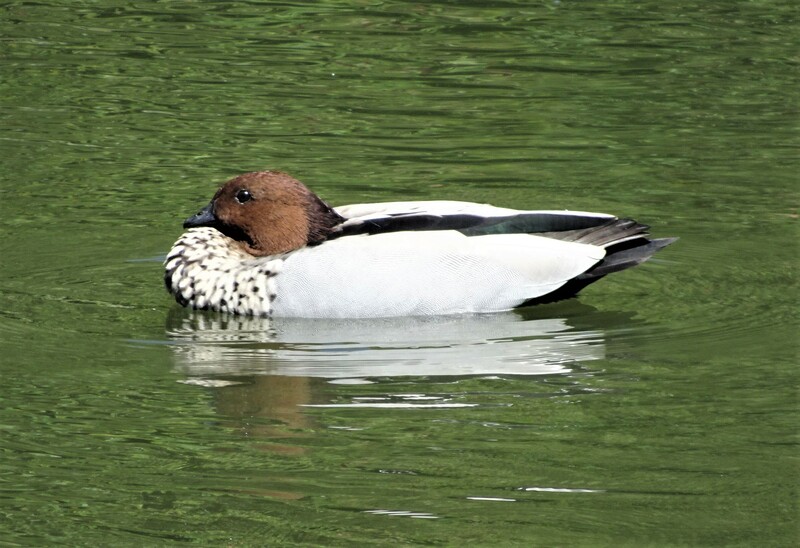 The alternative name of Maned ducks comes for the ‘mane’ of chestnut brown feather on the neck of the male. Such a handsome fellow and a fine ‘mane’. Nesting in trees (as wood ducks do) has its benefits, especially if there are foxes about. However, the fledglings are forced to leave their downy nest and simply topple to the ground in a true leap of faith. It must be rather scary, but as they are so light and fluffy they rarely come to any harm. I was delighted when our little family finally appeared down at the local pond. Come on, time for a swim! There’s always one little rebel! Mum and Dad will be very cross if the cars don’t stop! Proud parents together on Blackheath’s golden pond. A few days later a council worker told my husband that one little duckling had been found dead in the nearby public swimming pool. Oh dear, probably that wayward little blighter. After that we didn’t see the family at all. We presumed that the chicks must have been taken by a fox. I refused to think that my darling kookaburras would have eaten them. A few days ago I walked down to Memorial Park. I wanted to take some photos of the giant rhododendrons. I walked past the pond and to my great joy, there were the wood ducks! Another youngster was missing, but still……..
Nearly grown up, but still in parental care. It had been unseasonably wet and windy for days. I could understand the family’s choice to soak up some sunshine rather than take a dip. A couple more weeks and it will be difficult to distinguish the youngsters from their parents. We spent some time this morning watching the family forage for greenery in the shallows and sailing around the pond. Mother wood duck was quick to ward off any intruding males with a hiss and a threatening lunge. Good grazing. And no danger now. Wood ducks mate for life. I hope our breeding pair will produce many more little families. And maybe they will learn to keep the toddlers away from that damn swimming pool. Finally, I cannot resist including this wonderful photo taken by Leigh Wilson. I count 15 little ducklings swimming along with their proud parents..
Reducing my wind resistance, Mate. I think the female in the photo below wants to join the circus. Look, no wings, one leg! The entertainment provided by the wood ducks is only rivaled by our resident bowerbirds. Thanks Caren. I do love the birdlife here. Woodies are such lovely birds aren’t they! Enjoyed your story and photos as it brought back memories of when we lived on acres. Every year the resident Woodies would raise their family nearby, often as many as 12 ducklings. However by the time they were fully grown (only 7-8 weeks), the numbers were always very much reduced. A sad fact of nature unfortunately but if they all survived every year, we’d be overrun with ducks. Yes, Christine…nature always finds a balance. They are so sweet.